Triple Crown reached dizzying heights of Group 1 glory with Hot Snitzel in the 2015 BTC Cup and boy oh boy, they almost pulled off the miraculous task of snaring back-to-back victories in the same race. 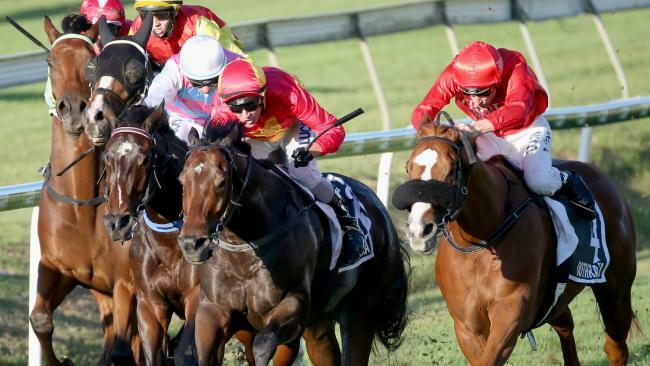 In a heart-stopping finish, Dothraki finished a nose second to Malaguerra in the $500,000 Group 1 BTC Cup (1200m) on Saturday 14 May at Doomben, earning connections $100,000 for his second placing, while boosting his career earnings to a tick under $1 million. Not a bad return for a yearling that cost the Triple Crown team $45,000 at the Magic Millions Gold Coast Sale. Jumping beautifully from barrier one, jockey Blake Shinn (who rode Hot Snitzel and Charlie Boy to Group success at the Brisbane Carnival last year), had the five-year-old son of Mossman perfectly poised with cover throughout to take advantage of the hot pace set by race leader Two Blue. After biding his time, Shinn pulled Dothraki out at the 300 metre mark to chase down Two Blue and bypass Malaguerra only to be pegged back by the latter in the last stride. “Dothraki ran out of his skin and Blake gave him a 12 out of 10 ride. “It’s disappointing to be pipped in a Group 1 by such a short margin but the horse raced up to expectations and was given every chance,” said co-trainer Peter Snowden. Dothraki will now press on to Brisbane’s premier weight-for-age event, the $750,000 Group 1 Doomben 10,000 (1350m) on Saturday 28 May at Doomben, with stablemate Charlie Boy, who finished a whisker second to 5-time Group 1 winner Boban in last year’s edition. Despite Dothraki’s narrow loss in the BTC Cup, Team Snowden enjoyed huge success in their home town of Scone last weekend, snaring both the $200,000 Listed Emirates Park Scone Cup with Pajarro (Tim Clark) and the $400,000 Inglis Scone Guineas with Serene Majesty (Kerrin McEvoy). In addition to their gutsy wills to win, both thoroughbreds enjoyed perfectly-timed rides by Clark and McEvoy, bringing up an astonishing 106 stable wins for the season so far.